Hey there! Thanks for dropping by Ulysses' Blog! Take a look around and grab the RSS feed to stay updated. See you around! I used Kubuntu Maverick before it’s first alpha released, I upgraded my system from Jaunty. But between the beta and the RC something went wrong… The load went high often, the GUI freezed out, and I had to return to Lucid. I hoped that the problems will cease, but they didn’t. When Maverick released I upgraded again, but the problems still exist. I would like to use KDE 4.5, but in Kubuntu, I simply can’t, however I am a Kubuntu user since 7.10 Gutsy Gibbon. I have now two choice: returning back to Lucid, or switch to an other KDE distro. Today my account was created. 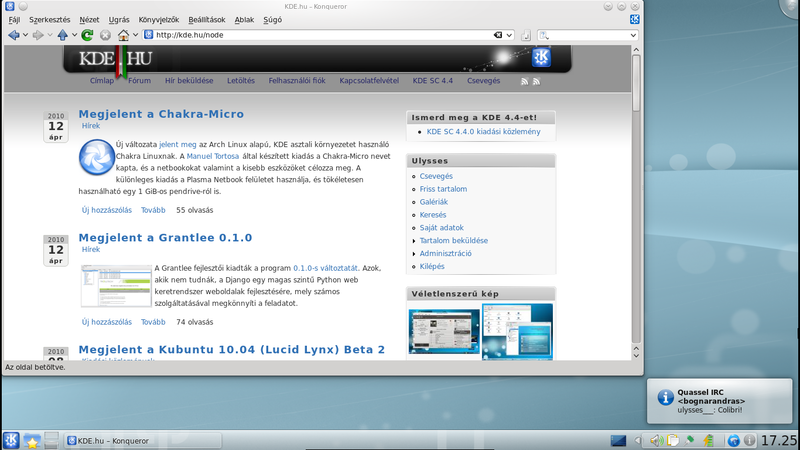 I am working on the Hungarian translation of KDE 4.5, the extragear-base is almost fully translated. My goal is to translate fully the KDE 4.5 applications, but I know it is impossible:) Probably KDE 4.6 will be fully Hungarian. Kubuntu 10.04 Lucid Lynx released yesterday, however I have upgraded my system on wednesday to help testing the Kubuntu amd64 proccess. The upgrade went fine, there wasn’t any critical bug, I should only delete a few hidden directory, like .font and .kde, to avoid some annoying issue. Kopete had also problems, I’ve reported it on Launchpad. It’s an upstream bug of Kopete, but there is a workaround, remove and then install Kopete. The good thing is that my system boots very fast, I can’t even see the new Plymouth theme. My browser is Rekonq now, its speed is amazing. This system was upgraded from Kubuntu 9.10 Karmic Koala, which was upgraded from Kubuntu 9.04 Jaunty Jackalope. I hope there will be much more successful upgrade in the future. Live long, Kubuntu! Kubuntu 9.10 Karmic Koala has a nice notification system called Ayatana. The notification system of KDE is ugly in my opinion, so I like Ayatana very. It is very beautiful, and it is more beautiful if the desktop effects are enabled. Ayatana is a Canonical-community joint effort to discuss and promote improvements to the Ubuntu user interface. See this link for more information. When the Karmic Koala released, we (the editors of the ubuntu.hu) wrote about Ubuntu, Kubuntu and Xubuntu at the same time. As the most active Kubuntu user, I wrote the Kubuntu 9.10 announcement. And this is only the Hungarian LoCo site. Sometimes I write articles at kde.hu also, but my priority is the LoCo site. I think I wrote everything, see you later! Yesterday I enabled the karmic-backports repository to install KDE SC 4.3.4. The upgrade went fine except the kde-l10n-hu package: it conflicted with the kde-i18n-hu package (it’s a known problem, there are some bugreport on Launchpad), this affects all kde-i18n-* package. So if you want to upgrade your KDE to 4.3.4 from karmic-backports, first remove the kde-i18n-* package. There’s another issue when I watch videos with VLC: in fullscreen mode the XVideo output doesn’t hide the panel. At this moment I can’t find a workaround for it, however I’m not a Kubuntu developer, I would be happy to fix the kde-i18n-* bugs. So let’s go to #kubuntu-devel! My name is Kristof Kiszel, I use ulysses__ (on Freenode) or Ulysses (on forums and Launchpad) as nickname. I use Ubuntu since 7.10, but I switched to Kubuntu after several month, that was also Gutsy. After Jaunty released, I started to contribute to Ubuntu and Kubuntu. First time I wrote community documentations for the Hungarian Documentation team, when the translation of Karmic opened, I started to work on it. I’ve translated a big part of the Kubuntu system documentations, reported some bugs, and reviewed it on the Ubuntu GlobalJam. On 16th December 2009 I became a Kubuntu member. Now my goal is to make Kubuntu 10.04 better.